A new in vitro study by ECE ILLINOIS researchers is advancing the possibility of long-term blood sugar control for patients with type I diabetes without the high risk of surgery or lifelong insulin administration and glucose monitoring. A drug-carrying microsphere within a cell-bearing microcapsule could be the key to transplanting insulin-secreting pig pancreas cells into human patients whose own cells have been destroyed. In the study, the insulin-secreting cells, called islets, showed increased viability and function after spending 21 days inside tiny capsules containing even tinier capsules bearing a drug that makes the cells more resilient to oxygen deprivation. Type I diabetes is a chronic condition where the pancreas produces little or no insulin. According to the Mayo Clinic, there is no cure. Treatment focuses on managing and monitoring blood sugar levels with lifelong insulin. Whole pancreas transplantation is another option, but the surgery carries high risks and requires lifelong immunosuppressive medication. However, a new in vitro study by ECE ILLINOIS researchers is advancing the possibility of long-term blood sugar control without major surgery. 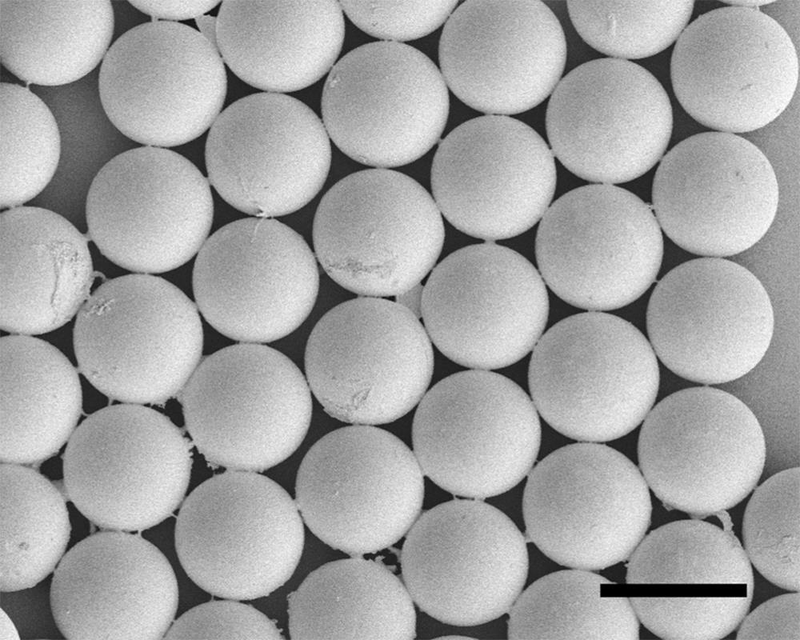 “Sustained exenatide delivery via intracapsular microspheres for improved survival and function of microencapsulated porcine islets” demonstrates how drug-carrying microsphere within a cell-bearing microcapsule could be the key to transplanting insulin-secreting pig pancreas cells into human patients whose own cells have been destroyed by type I diabetes. In the study, the insulin-secreting cells, called islets, showed increased viability and function after spending 21 days inside tiny capsules containing even tinier capsules bearing a drug that makes the cells more resilient to oxygen deprivation. The results were published in the journal Drug Delivery and Translational Research. 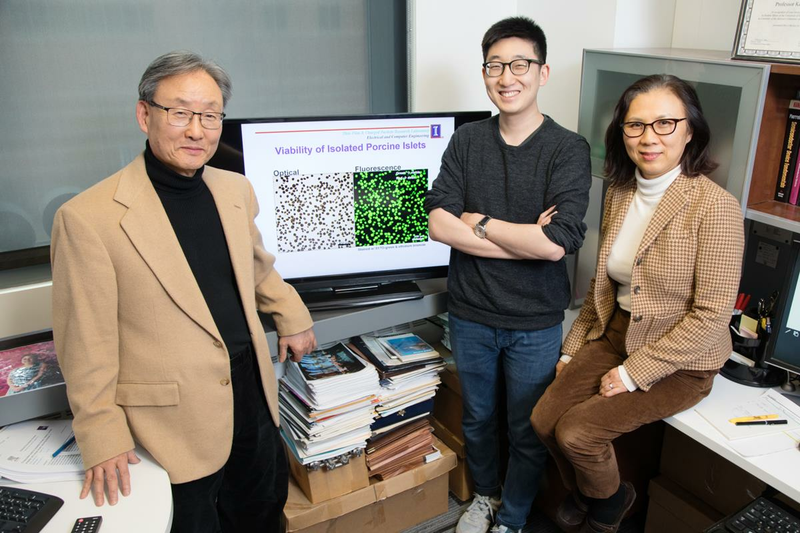 Professor "Kevin" Kyekyoon Kim and Senior Research Scientist Hyungsoo Choi have been exploring ways to transplant pancreatic islets to treat type I diabetes long term, eliminating the need for continual glucose monitoring and insulin injections. However, there are a number of challenges to this approach. “First, you need viable islets that are also functional, so that they secrete insulin when exposed to glucose,” said Kim, the leader of the new study. Islets from humans are scarce, he said, but pig tissue is in abundant supply, and pig insulin has been used to treat diabetes since the 1920s. The pig tissue for this research was procured from the Meat Science Laboratory at the University of Illinois. The method developed allows them to make tiny, uniform capsules and control the size, allowing for a capsule-within-a-capsule technique. Image courtesy of Prof. Kim. ECE ILLINOIS graduate students Benjamin Young Lew and In-Yong Kim were co-authors of the paper. Kim and Choi are members of the Micro and Nanotechnology Laboratory at Illinois, and Kim also is an affiliate professor of bioengineering, materials science and engineering, nuclear, plasma and radiological engineering (NPRE), and the director of the Thin Film and Charged Particle Research Laboratory. This work was carried out in part in the Frederick Seitz Materials Research Laboratory Central Facilities and Beckman Institute for Advanced Science and Technology at Illinois.